I think it's safe to say now that I like Jon Favreau. I can't get behind his whole cannon (I think Swingers is the absolute worst), but he's got some things I really like under his belt. So, when I heard that he'd directed the most recent incarnation of The Jungle Book, I was quite interested. In a post Life of Pi world, though, I was cautious. Could they achieve the same sort of believability? In a word: yes. Need Sethi, who plays Mowgli does a crazy good job of acting this whole thing by himself. Sure, he's surrounded by heavy hitters like Ben Kingsley and Bill Murray, but they're not inside the animal costumes, so he's basically doing the whole thing by himself. The CG is great, especially the wolf pups, which are so cute. The interaction is almost completely seamless, and it's really easy to suspend your disbelief. The one thing that I didn't love was Scarlett Johansen as Kaa. That may just be me. She's not my favorite. She manages to make everything unnecessarily sexual. Also, I hate snakes, so...there's that. The role of Bagheera was made for Ben Kingsley, though. I'm in full support of that casting choice. The story is a l little different this time around, and I quite liked it. 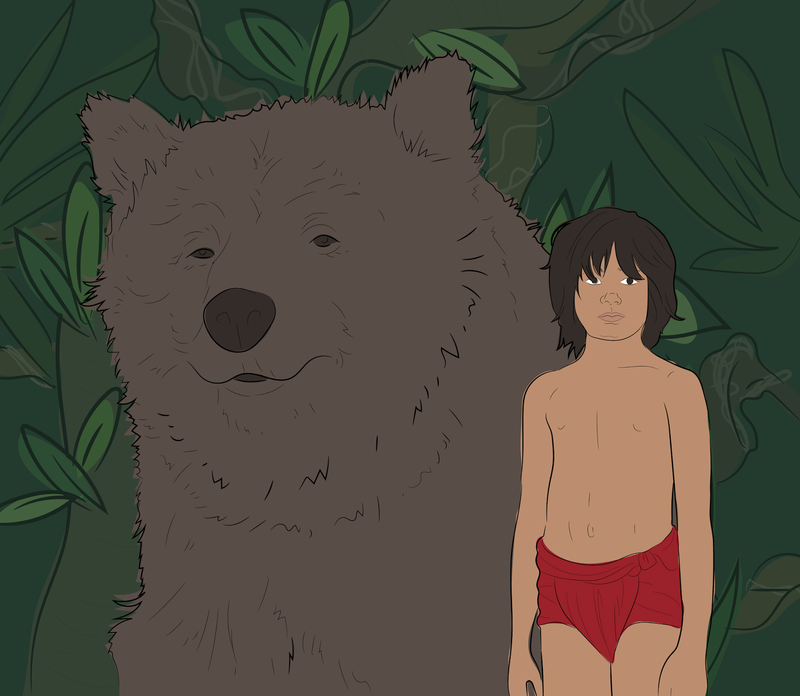 There's no oddly flirtatious little girl to lure Mowgli away, but I won't tell you how the movie does end. I think you should go see it..and see it in the theater. The grandeur of the jungle setting begs to be experienced on the big screen. I wear glasses, making 3-d kind of annoying for me, but I can only assume that it is incredibly immersive with those plastic shades on your face. To sum it up: go see it. It may be too scary for young children on account of the realism of the CG, but it's good. I think you'll like it.